Recently, Nanshan Cultural Tourism Zone, Hainan’s largest national 5A scenic spot, has embraced a surge in tourist arrivals, with the daily number jump to 12,000, increased by 74% over the same period of last year. Among the arrivals, tour groups regarding MICE travel and rehabilitation purpose and individual tours are the main components of tourist sources. Besides, the number of overseas tour groups from Russia, Singapore and Malaysia are also increasing. On Nov.16 to 17 alone, over 1,100 visitors from Tianjin senior groups flocked to Nanshan to experience the Buddhism and longevity culture while enjoying the warm climate here. 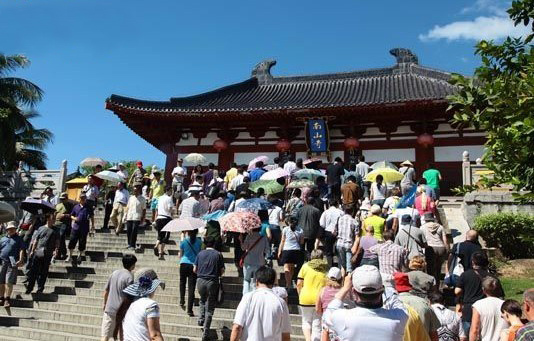 More different types of tour groups are scheduled to pay their visits to Nanshan from later November and December, according to a responsible person of the spot.